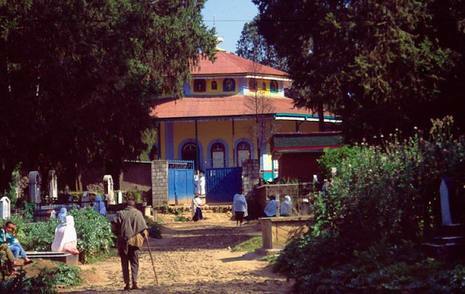 The Asra Hawariat school is in a suburb of Addis Ababa. We weave our way there through the chaotic streets of the city, a shabby mosaic of mud and wattle houses. Shacks selling bananas and bottled water rub shoulders with half-built skyscrapers held up by eucalyptus scaffolding, walled properties and churches with tin roofs. The roads are liberally strewn with litter (mostly plastic) and we overtake goats, donkeys, skinny horses pulling laden carts and streams of men and women walking, wearing white shamas. The Asra Hawariat school was set up in 1961 by Asfaw Yemiru. By 1965 the school had several hundred pupils and was officially recognised by the Ministry of Education. Today there are around 850 pupils aged between 5 and 13, more girls than boys, with 30 or 40 children to a class and a total of 28 teachers. The school’s Grade 8 National Exam results are amongst the best in Ethiopia. Asfaw is intensely proud of the school and its mission of offering hope and a future to children who would otherwise have neither. Now in his late 80s, he is dignified, compassionate and charismatic. I am told that in the city, people sometimes kneel before him and kiss the hem of his garment. As a child, Asfaw ran away to the city and lived on the streets from the age of 9, until he was given a home and a job by a family. He was awarded a scholarship to the General Wingate School, a boys’ boarding school (long since closed) run by the British Council. While he was a teenage pupil here, Asfaw taught street children under a tree in the churchyard nearby and arranged for them to be given the left-overs from the school kitchen. At the school’s second premises, in lush grounds, recently opened airy classrooms are proudly labelled physics, biology, chemistry. There is an art room, a music room and a library with well-thumbed but often lamentably out-of-date books. And there is a farm here, which Asfaw set up as a valuable educational tool, and as a source of fresh milk and food for the Child and Family Aid Programme, which includes the foster families who take in orphan children. Fruit and vegetable seedlings from the greenhouse are given to pupils and their families to plant at home, or in their neighbourhood. The school also provides training in health issues, with the emphasis on prevention. By comparison with facilities at any independent school in the UK, where hundreds of thousands of pounds are spent on updating technology, state-of-the art laboratories, sports halls, libraries and computers, the Asra Hawariat School is almost pitiful in its simplicity, but there is a vibrancy and extraordinary richness here too. To witness and feel the respect staff and pupils have for education, and for its value, was a sobering and humbling experience. Now the enterprising Pushkin Press has decided to bring the series to a new generation. 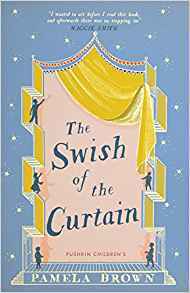 The Swish of the Curtain and Maddy Alone are out this month and the other books will follow later in the year. The stories, first published in the 1940s, are slightly old-fashioned but the Pushkin team has helpfully provided notes to explain references that might puzzle today’s readers. For instance, prep means homework, an ordermark is ‘a formal record of bad behaviour at school’ and the School Cert and Higher School Cert were the precursors to GCSEs and A levels. Most importantly of all, the tales of Lyn, Sandra, Vicky, Bulldog, Nigel, Jeremy and ebullient nine-year-old Maddy have stood the test of time. Their determination to make a success of the Blue Door Theatre Company, write scripts, design sets and costumes and build acting careers will charm readers new and old, young and not so young. Bravo Pushkin Press for bringing them back. Our sixth edition of Chalk & Chat magazine goes live on The Good Schools Guide website this week. As you’ll see, our digital parenting magazine has a new look for the summer. It’s still an informative and enjoyable read, but we’ve taken on readers’ feedback and made it even easier to navigate. Highlights from this summer issue include an interview with mental health expert Cat Williams, who believes resilience is the golden ticket to coping with the challenges of growing up – one that parents can help their offspring with probably more than they realised. Other features include schools that stand out for teaching enterprise, how to teach your kids to touch type and the tell-tale signs that you might have been – shock, horror – wasting money on a tutor. Our regular lowdown on moving to a particular area focuses on Royal Tunbridge Wells. On a lighter note, we bring you the best bikes for your kids to ride around on this summer, as well as some of the top places to holiday with your family. And there’s more. Chalk & Chat first came about in 2016 as a result of website subscribers asking us to widen our conversation around schooling and parenting into a magazine for parents. The result was a termly magazine that aims to have the Good Schools Guide hallmark of frank, honest and transparent writing that’s witty, informative and fresh. It’s all about celebrating being a parent, while at the same time as acknowledging the hurdles and lower points. There are debates, opinions, roundups, guides, features and more – always with our children at the very heart of discussions. As I said at the launch of our first issue, if we all knew each other, this is what we’d do – share experiences, offer advice and discuss challenges. We hope you’ll join our conversation and that you’ll tell us what you think of the new-look magazine. We always strive to do better, so keep the suggestions coming – this magazine is for you. Poetry please. Congratulations to pupils at Oxford Spires Academy. Their poems, many of which shed light on the lives of young migrants in the city, impressed the school’s poet-in-residence Kate Clanchy so much that she persuaded Picador to publish them as an anthology. The collection is called England: Poems from a School and is out now. Just the ticket. A group of London companies has set up a homework club at Eurostar’s HQ in King’s Cross for local A level students who don’t have anywhere quiet to study at home. War on plastic. ‘Plastic’ has been declared children’s word of the year, after thousands of youngsters featured it in entries to BBC Radio 2’s annual 500 Words competition for children aged 13 and under. The next generation has clearly taken the environmental message to heart. Turn the heating down. Taking exams can be stressful enough, without having to sit in sweltering classrooms and stuffy school halls. Now US academics have found that hot weather can adversely affect children’s chances of doing well in exams.